Armchair Book Expo Headquarters: Ten Things You Won't Miss at BEA! I don’t know about you guys, but rocking my Armchair this year seems to be the way to go. Last year I went to NYC for the first time and did everything at BEA. When I got home I needed a vacation from my vacation. I slept for a week! Here are ten things you won’t miss while couch surfing the conference. 10. No wifi: The hotels in NYC either don’t have wifi or charge you a ridiculous amount to use it. Like $10 a day where I stayed last year. I am sure there are some exceptions to this but if a hotel is trying to pull in consumers with wifi when none of the hotels I know are safe have free wifi then I probably ain’t gonna stay there. 9. Eating out: I don’t know about you guys but three meals a day from restaurants just make me tired. You have to wait to be seated, you have to wait to order, you have to wait for your food and you have to wait for the check. You also haven’t seen anything while waiting for a coffee in a Starbucks in Manhattan. Could literally take an hour. 8. Traffic: Even taking the free shuttle from Times Square can be hazardous. Getting to Javits requires iron will and patience abound. 7. Personal Space: No matter where you are in NYC your personal space needs will be tested. Even in your hotel room if you are rooming with other people. I like a little bit of alone time each day. Even five minutes can make a difference and let me tell you; you just aren’t going to get any. 6. Decisions: Usually there are two or three parties per night. Six or seven signings you want to visit at the same time on the floor. So many people to have a coffee with or just say hi. Just making decisions on what to do and what to skip is enough to give you a coronary. 5. Boxes. I filled two huge boxes full of books last year. If going this year I really wouldn’t do that. I would grow some balls to say no to the stuff I really didn’t want to read, however each book found a forever home with some non-book blogger peeps. 4. Smog. NYC has this haze of lung filling smog no matter where you go. By day two my hair was in shambles. By day three my voice was completely gone. Go green NYC GO GREEN! 3. The sights. Unless you go extremely early or stay later you won’t be doing any of that sight seeing that you think you will in NYC. You are SO TIRED from BEA that you can barely make it through whatever dinner you have scheduled for the night. 2. Family. You will never have to be homesick or miss your family. I was so worried about how my kids and husband were faring that I spent a ton of my time just calling to say hi. 1. $1,500. Yup that is what BEA cost me but I admit I am a bit more prissy than most. Between shipping two boxes home, 3 meals a day and snacks, flights, hotel, drinks on the floor… you will spend more than your budget allows guaranteed. So there is what you won’t be missing. What do you feel like you won’t or will miss? I love this! I've never been to BEA, but I went to ComicCon. While fun, it is exhausting. I was up for 40 hours straight and took a late evening off to sleep forever. You definitely don't get the sleep you need at these kinds of things! Excellent post! I am glad to see the negatives so I don't feel so left out. And an hour at Starbucks?! I have never heard of such a thing. WE on;t have one in our town and it still take 10 minutes, max, at the height of the Christmas season when it seems to be busiest! WOW! That was eye opening! Wow from me too! lol...I'm actually glad I'm not there, this will be a good week to listen learn and prep for next year so I can go with eyes wide open!! This post made me lol. I've never been to BEA or anything like that but I did go to school for 8 years in NYC (and still live in the area). You have listed everything I won't miss about my years in the city. I may go next year if I can will myself to go to NYC again. those are awesome arguements but i would love to have two boxes filled with books... my book addiction tend to blind me when it comes to the cost of them. however the $1,500 IS a scary after math on coming back home from such an event.lol. Even though I would *love* to visit BEA and meet so many other bloggers (the social aspect is really the one reason I would LOVE to visit BEA), I don't mind not missing the money (a plain ticket alone would probably be 1000 dollars) and the time (I really cannot afford to miss a week). I am also unsure if the huge city wouldn't severely confuse me. Iwould have to be with someone all the time to feel I could deal. But who knows.. Maybe one day? Ugh, plain ticket of course should be plane ticket. Great post! I definitely got a kick out of the picture. I will not be missing that at all! Well done! I've been to NYC several times, 3x just for BEA, and it's never a vacation! HAHA, I'm from NYC and am there right now and lemme tell ya, the weather is so crappy this week you will be glad that aren't here. I'm also not surprised that you spent that much! Nothing within walking distance from JJ is inexpensive! Excellent post, I don't feel quite so left out now. Maybe staying home and Armchairing it is the way to go. I have to admit...you got me laughing. but....but.... I do love NYC. LOL Now I dont feel so left out. Although I would like to go just once just to see whats its like. Great post. And what an eye-opener! I still want to go....one day. But I'm happy to be armchairing it this year. I don't know if I could do the personal space thing. I get so claustrophobic. wow, $1500. i suppose i should have expected that, but wow again. Awesome post. It makes me feel a whole lot better for missing it. But I don't think I'd mind #6 or #5. Having too many options and too many books isn't nearly as bad as the bedbug riddled hotels or the $1,500 out of pocket. Great reminder and I'm with you on the whole personal space thing. Yikes, there are crowds within the crowd, huh? I haven't been to BEA but I have been to New York and I can tell you I'm not missing the tiny hotel rooms. I understand space is at a premium but with a family of four I'm happy to have my whole house available to me right now. $1500 for BEA! OUCH! I dunno if I could handle spending that. I have too many things going on right now - wedding, wanting to buy a house etc. *sigh* Maybe in a few years I will be able to attend. I'm sure NYC would be a culture shock for me. I'm from a really small town and although I've been to big cities (I lived in Chicago for a year) I'm not really fond of them! Hmm well I still have the urge to go sometimes, but I do admit that your list of the negatives are kinda..well negative. I do like to have my personal bubble of space, so that is a BIG nuh uh for me! I loved NYC. Well, when I visited I stayed in Manhattan at the Waldorf. It was okay I suppose. Kinda old though. Thought it was going to be real nice like on Coming to America. lol. But I enjoyed the atmosphere of the New Yorkers. Never seen so many people walking. Everyone seem to be in a rush to get somewhere. 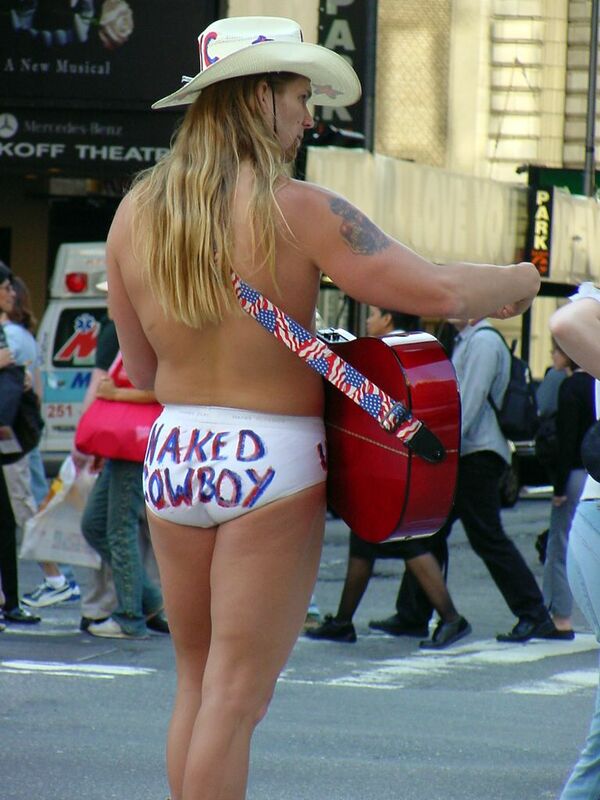 But I didn't see the naked cowboy. I wanted to. It is quite expensive, so I will be saving to go next year. Very good post! One thing I won't miss is the cross-country travel--I really don't enjoy traveling by plane anymore! There always seems to be some hassle or other. Reminds me of trips to theme parks. After a long day of walking and waiting in lines your pretty much recuperating all day the next day. I completely forgot about Wifi too. I went to RT last year and the hotel I stayed in were charging $10 on top of already being expensive so I never bought it. Thanks for this. The one time we went to ny it cost us a bunch. If I did go to BEA, would be bringing the family and turning it into a vacation. Wonderful post! Thanks for the insight. What a great post. I was laughing and nodding my head reading it. I know one thing I don't miss is the constant honking of horns plus the early morning construction happening. Using the shuttle bus was brutal at rush hour I am sure we could have walked back to our hotel faster then the bus. Thankfully where I stayed had wifi so it was nice to keep caught up on emails. I have never been to BEA but I have been to comic con at the Javits center and can agree that there is no personal space. I didn't have good cell signal inside the Javits. I would like to go to BEA at least once. Okay, WOW. Maybe I don't want to go to BEA after all.... or maybe just once so I can say I did. Oh wow, I knew that BEA would be tiring but I had no idea it would be THAT tiring so thank you for making this post. I'm sure I'm not the only one who feels better after reading this. And thanks also for mentioning how much you spent because I was wondering about that. So if I ever decide to go, I'd need $1500 pocket money and another $1000 for the airfare from the Philippines to the US. Well... damn. Definitely not gonna miss those things! I feel so much less of a loser now. I'm winning....I'm winning...thank you, Pam. The $1,500 alone keeps me away. $1500? I think I will be Armchairing it for a while. Coming home from the job and reading all these comments is fabulous. ARMCHAIRERS rock! While I get all that, and am more than happy to be ArmchairBEAing, I have to say I would still absolutely love to be able to schedule a trip to the US to coincide with BEA! In the mean time, I am here in wintery Melbourne, still having an awesome time! LOL! Love it. I would miss my little guy too much. I took him to ALA with me and that was hectic, but I couldn't be away from him.. soo armchair it is! :D Thanks for hosting this. BEA is a must do for next year so I'll have to budget $2000 ahead of time I guess. thanks for the heads up and these are to cute! Thanks. Made me feel a little less jealous. Just a little. Thanks for the fun post! I'm a litte less green with envy right this moment. Reading your post made me just "plane" tired!